Who doesn't love a comeback story? This week in 1989, an artist returned to the Australian singles chart after an absence of almost 12 years and scored his first top 10 single here in 18 years. It wasn't just any comeback - it was a career reboot that saw the star of the '60s and '70s reinvent himself for a new generation, something he did again in 1999 and as recently as 2012. Another act on the comeback trail was still at number 1 this week in 1989. Yep, The Beach Boys held on to the top spot with "Kokomo" (their first Australian chart-topper in nearly 19 years), which was showing no signs of going anywhere any time soon. Re-released to coincide with parent album Bat Out Of Hell coming out on CD, this 1978 single did something it hadn't done before - cracked the top 100. After two top 50 hits in "Don't Go" and "I'm Sorry", the Irish band charted with one more track (with a slightly shortened title) from debut album People. In 1982, this Talking Heads side-project had reached the top 50 with debut single "Wordy Rappinghood", but they didn't repeat that achievement with this lead release from third album Boom Boom Chi Boom Boom. Best known for his 1978 hit "Short People", future Toy Story soundtracker Randy Newman slipped into the top 100 with this track featuring Mark Knopfler on guitar from the Land Of Dreams album. If anything was going to give Aussie rockers Kings Of The Sun a hit single it was this racy little number, which I remember being hammered by late-night MTV at the time. The clip did, after all, feature a lingerie-clad model or two and frontman Jeffrey Hoad prancing around in tight leather trousers. 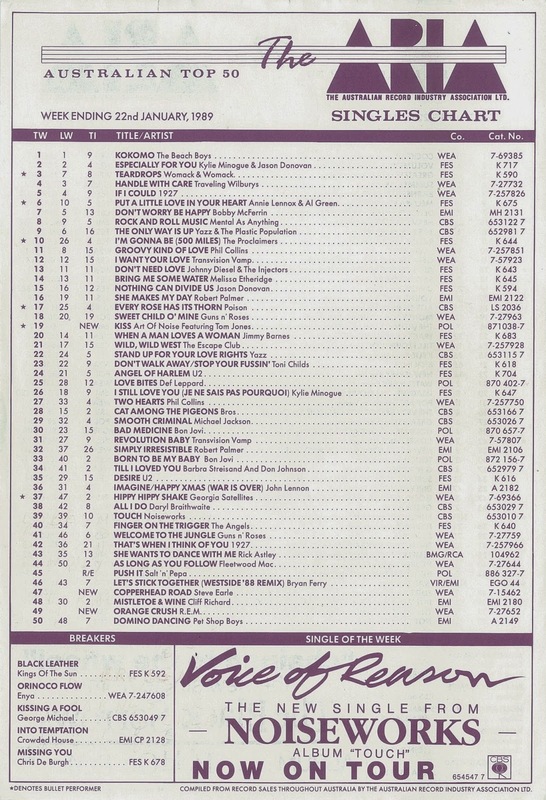 Despite the gimmick (and a publicity storm after an ill-fated support slot for Guns 'n' Roses in December 1988), "Black Leather" ended up just missing the top 50. The band has continued on and off until the present day, but a rather dismal number 82 performance for their 1990 single "Drop The Gun" was the only time they ever troubled the top 100 again. Number 49 "Orange Crush" by R.E.M. It's amazing what major label support can do. For years, student radio favourites R.E.M. had slogged away building up a following with their alternative rock tunes. 1987's "The One I Love" had become their first crossover success, but things really took off for the band after they signed to Warner Bros Records in 1988 and this first single from the Green album catapulting them into the mainstream. "Orange Crush" is one of two new entries on the chart this week that were about young soldiers fighting in the Vietnam War, with the song title a reference to the chemical weapon Agent Orange. The second song with Vietnam War-related lyrics is this country/rock track about soldier John Lee Pettimore and his illegal activities on Copperhead Road. The best thing about revisiting this song is learning that not only is Copperhead Road a real place in Tennessee, but that the name of the road had to be changed since fans kept stealing street signs. Here's the man we hadn't seen on the Australian singles chart since 1977 (although he'd had some success internationally in the intervening years). By way of contrast, it hadn't even been three years since this song was last in the top 50. Originally a hit for Prince, Art Of Noise's cover of "Kiss" was a new track on the increasingly reduced (only two of the original five members were left) group's best of album, which also included "Moments In Love", "Close (To The Edit)" and their only other Australian top 50 hit, "Peter Gunn". Next week: the ARIA chart gets a major makeover (yes, another one) and there's a new entry from an artist who hadn't had a major hit for even longer than Tom Jones. Plus, two debuts from former band members going solo. Before then, I'll conclude my countdown of my favourite songs from 2000 (Parts 1 and 2 are already up). I think I can guess what the 'major makeover' is (though don't want to ruin the suspense for anyone who may not know). Though I will say (perhaps giving it away) that I'll miss the random variation that we've had in the printed charts up until now, with no discernible (at least to my eyes) pattern. Though this printed chart was a way to go out with a bang, with my favourite 'theme'. If my memory serves me correctly, we won't see the same 'variety' again for nearly 3 years, and then, only partially and for a limited time. Somehow the original Prince version of 'Kiss' completely passed me by, and so this Art of Noise/Tom Jones track was like a new song for me. 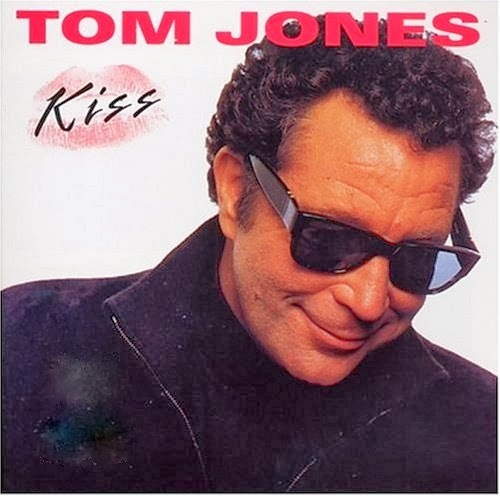 I'd never heard of Tom Jones either until this point.